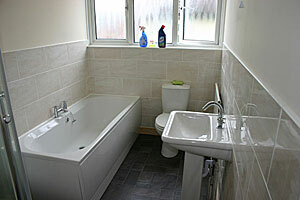 Builders - Coalville - Ashby De La Zouch - Shepshed - Loughborough - Swadlincote - Derby - Burton upon Trent. 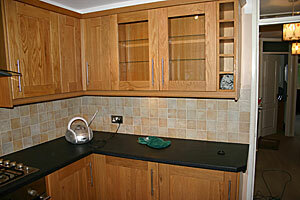 We offer a full supply and fit service using quality, pre-built cabinets from a major national supplier. We can arrange for a professional kitchen designer (employed by the supplier) to visit your home and discuss your needs at no cost to yourself. 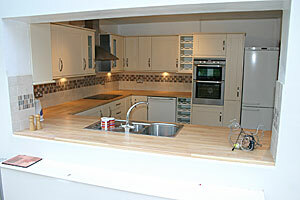 They will provide you with CAD images to help you visualise how your new kitchen will look. Once you are happy with the design we are able to arrange every aspect of your kitchen refit, including any plastering, gas, electrical, tiling and flooring work that may be required. All electrical work carried out in a kitchen or bathroom must be tested and certified to Part P Regulations and this is carried out by an NICEIC electrician and all gas appliances are fitted by a Gas Safety registered sub-contractor. Burford – Ivory Shaker style door fitted to ivory carcasses’ with matching cornice and light pelmet. 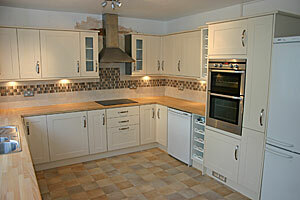 Free-standing fridge/freezer, free-standing electric cooker and extractor fan, beech butchers block worktops. Tiles to the walls and down lighters fitted for mood lighting. Tenby – A classic barrel top style ivory door fitted to ivory carcasses’ with matching tongued and grooved side and end panels with matching cornice and light pelmets. 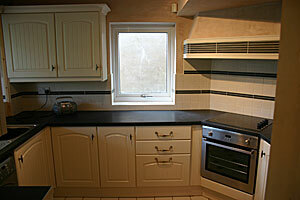 Built- in oven and ceramic hob. Tiles to the walls and black marble style worktop and a special effect built-over extractor fan with matching tiles to walls. Tewkesbury Oak Shaker style doors fitted to Oak veneered carcasses’ with matching cornice and light pelmet. 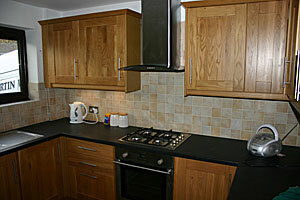 Built-in gas hob and electric oven with extractor fan and built-under refrigerator and washing machine. 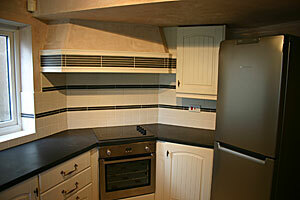 Tiles to the wall, black marble style worktop and down lighters fitted underneath the top units. corner entry shower cubicle with Triton electric shower. and marble effect tiles to the walls.